As in February, investors spent most of the first full trading week of March hoping for new details in U.S.-China trade negotiations. While they waited, stock benchmarks drifted downward. From Monday's open to Friday's close, the S&P 500 lost 2.55%, while the Dow Industrials took a 2.66% fall, and the Nasdaq Composite weakened 3.12%. The MSCI EAFE index tracking developed markets outside the U.S. and Canada fell 1.09%. Harsh winter weather may have impeded hiring last month, and February's payroll growth could be revised in the Department of Labor's next report. Friday: The University of Michigan's initial March consumer sentiment index, measuring consumer confidence. 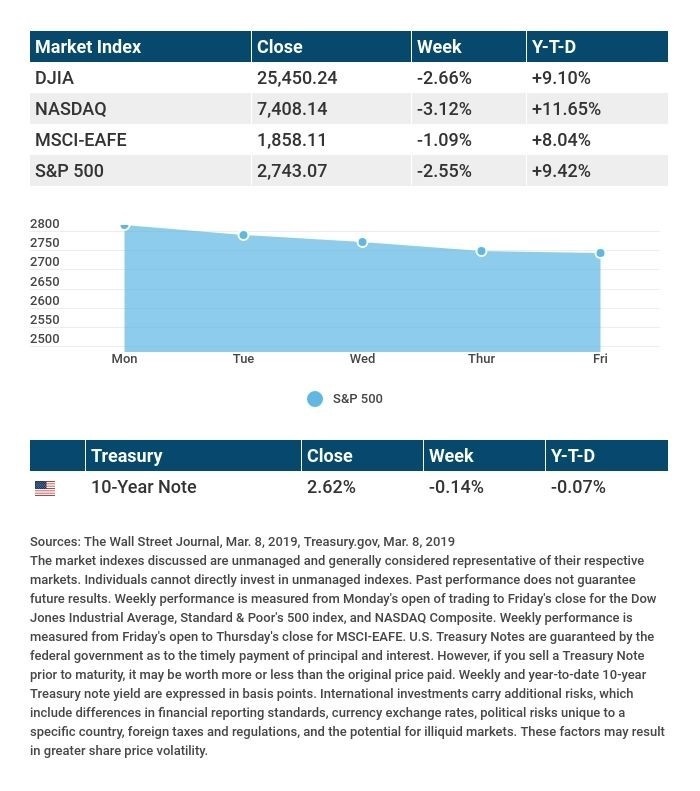 Source: Econoday / MarketWatch Calendar, March 8, 2019 The content is developed from sources believed to be providing accurate information. The forecasts or forward-looking statements are based on assumptions and may not materialize. The forecasts also are subject to revision. The release of data may be delayed without notice for a variety of reasons. Source: Morningstar.com, March 8, 2019 Companies mentioned are for informational purposes only. It should not be considered a solicitation for the purchase or sale of the securities. Any investment should be consistent with your objectives, time frame and risk tolerance. The return and principal value of investments will fluctuate as market conditions change. When sold, investments may be worth more or less than their original cost. Companies may reschedule when they report earnings without notice.